Aesthetic Design & Build is the premier builder of custom pergolas for St. Louis and St. Charles county. Pergolas provide your outdoor living space with filtered light but does not protect from rain or other outdoor elements due to its latticed covering and open pillars. This high end outdoor design element easily complements a multitude of outdoor spaces, and can serve as a stunning addition to a pool, deck, fire pit or patio that is nearly maintenance free. Customization options include drop shades and curtains for added privacy, lighting and custom staining and finishings. Our building process will ensure that your pergola will remain an elegant piece of your backyard year round. 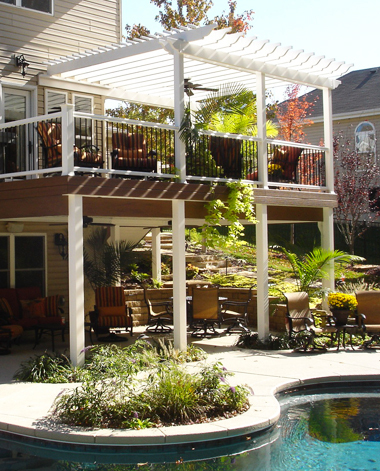 If you think a custom pergola is the perfect addition to your outdoor living space, contact us or call 636-532-5008.